Smart Highways Magazine is fortunate to have assembled a group of highly experienced experts from different sectors of the industry to make up its editorial advisory board. Editorial board members have been considering issues and working in fields related to highways for many years. We are pleased to share with readers their background and experience. To our knowledge, Paul is the only ITS magazine editor who has actually worked in the Industry at a senior management level. A Mathematicss graduate with a postgraduate diploma in Broadcast Journalism, Paul worked in radio news and presentation before taking on a management role in the UK’s leading radio traffic news company in 2000. Having worked on traffic news provision and served on the Travel Information Highway executive board, Paul became Managing Director of the European Division of Global Traffic Network in 2007 delivering the then-Highways Agency's radio station and overseeing the Company's operations in the UK, Australia, Canada and the US. In late 2011 he set up his own business and delivers his Smart Highways editorial duties alongside a number of consultancy and marketing services for companies in the ITS sector. Paul is a leading spokesman on ITS-related issues appearing regularly on radio and ever more frequently on TV. 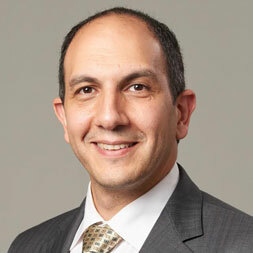 Dr Nabil Abou-Rahme is Chief Research Officer at Bentley Systems, His current focus is on leveraging digital twin models and connected devices to optimise asset performance. He has experience in digital transformation as well as the implementation of intelligent transport projects such as smart motorways, road user charging, and contactless payment systems. He sits on the CIHT Technology and Innovation Panel and the advisory board for Imperial College’s Centre for Systems Engineering. He held previous roles with Mott MacDonald, Rapp Trans UK, Mouchel Consulting, and TRL Limited (where he also completed his ‘part-time’ PhD). Eric Sampson CBE spent nearly 40 years in the public sector, most of it in Transport in which he was a vocal supporter of technology, rising to be Head of the Transport Technology and Standards Division at the Department for Transport. He is a founder member of the international study group that led to the formation of ERTICO ­ 'ITS-Europe' in 1992 and is still very strongly engaged with it. Sharon is Managing Director of Kapsch (UK). She’s a highly accomplished, billingual Executive Director armed with a commanding track record in strategic and operational leadership roles for multinationals, start-ups and influential trade bodies across diverse sectors including Telematics, Engineering, Manufacturing, Online Retail and Voluntary. She is Chairman of ITS (UK), Member of the IET Transport Policy Panel and occasional lecturer in ITS to Newcastle University. Lee is Director of ITS at Atkins, leading the company’s Intelligent Mobility business as part of its approach to smart and future cities. He has more than 25 years’ experience in highways and transportation, working in the public and private sector, providing advisory, design and operational services. Lee is a regular contributor to Smart Highways in the “Atkins Investigation” section of the magazine. Jennie is the Secretary General of ITS (UK), the world’s oldest national ITS trade association. She has been in this role for over a decade. Jennie was born and brought up in Sweden and came to the UK for a “short time” in her teens and has never moved back, meaning there are two national ITS associations run by Swedes! Her role representing ITS (UK) in the organisation of the ITS World Congresses and various ERTICO fora, makes her one of the most connected ITS professionals in the world. Mark is one of the UK’s leading experts on traffic signal technology, having been involved in the sector since the late 90s. His experience also embraces standards development, and he is the chair of the management group for TOPAS (Traffic Open Products and Specifications group). He also works with a number of Transport Groups in UK universities, the DfT, HA, Elexon and similar bodies.